The Vancouver Winter Olympics begin on Friday with the first-ever opening ceremonies held indoors. That decision seems prescient on the part of the organizers, given that Friday’s forecast is calling for rain, and some Olympic officials may be starting to wish they had scheduled the entire games to be conducted under controlled conditions. According to Environment Canada’s Mike McDonald, one of 30 meteorologists working at the Games, Vancouver’s average temperature of 7.19°C (44.9°F) in January was the highest ever recorded for that month and about 3°C warmer than the normal average. The unusual warmth has continued into February and caused a paucity of snow at some venues–particularly at Cypress Mountain, the site of the freestyle skiing and snowboarding events (moguls, aerials, ski cross, half-pipe, snowboard cross, and parallel giant slalom). The situation is so extreme that snow is continuously being shipped from other local mountains to Cypress by both truck and helicopter to ensure there is enough for competition. 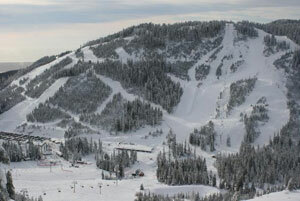 Olympic officials are hoping Cypress Mountain looks like this for the duration of the Winter Games. In addition to importing the snow, tubes filled with dry ice have been scattered across the mountain in a never-before-used technique that distributes cold air across the snow to help preserve it. The problem, of course is El Niño. . . . As I have explained before El Niños are associated with above normal temperatures and below normal precip after January 1. And substantially lower than normal spring snowpacks. Now, lets be careful…this is a correlation, not an exact prediction. El Niño winters tend to have less snow, but some have had more than normal. Now the problem we have is that we are starting the El Niño season with a below normal snowpack. . . . Lots of the NW is 65-80% of normal. The rising sea surface temperatures in the tropical Pacific that indicate an El Niño event were originally identified last summer, and what Mass calls a “moderate” El Niño has persisted through the winter and is expected to continue for months. Additionally, a flow of warm, moist air originating from around Hawaii known as the “pineapple express” could also be playing a part in the unusual warmth in the Pacific Northwest. And those blaming global warming should note that the Olympics have dealt with problems like these before, most notable in Innsbruck, Austria, in 1964, when a shortage of snow caused by a mild winter forced the Austrian army to carve out 20,000 bricks of ice to be used on the luge and bobsled runs, and also transport 40,000 cubic meters of snow to ski slopes, packing it down by hand.